Frankie Valli and The Four Seasons were a famous Rock N Roll four-piece group and which started in the early 1960s. You guessed it, they were from ‘New Jersey’. Back in them days there were three ways you could get out of New Jersey either as a criminal, joining the army or becoming super famous and heading out on tour. This musical tells the story of four young boys from New Jersey who made it big! Last night Katie and I attended the opening night of The Jersey Boys at the Palace Theatre in Manchester. Excited for the fact that over 25 million people have already seen the show and loved it worldwide and it also winning various prestigious awards like multiple Tony award’s and a Laurence Olivier award back in 2009. The stage opens to a burst of loud music to the famous ‘Oh what a night’ an updated version of the track which has been turned into a rap song. They then began the story by taking us back on a journey through the 1960s where the songs was first created and how the band got together. 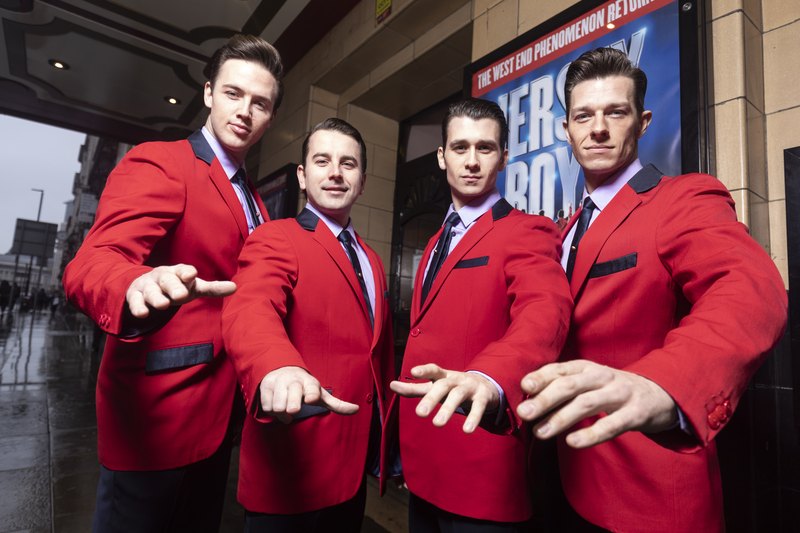 In enters the young boys Frankie Valli played by Michael Watson, Tommy Devito played by Peter Nash and Nick Massi played by Lewis Griffiths and later on we meet Bob Gaudio played by Declan Egan. We hear the young Frankie for the first time striking to hear how high pitch his voice is. I have never heard a man sing that high before in real life, I think when you hear the original; Frankies voice on the record it isn’t so strikingly because it’s pre-recorded, not performed live in front of you. Michael does an excellent version of Frankie if I shut my eyes it’s him! Then they sing ‘Earth Angel’ which brings back memories of the 80’s movie ‘Back to the Future’, where I first heard the song. It sounds even better to hear it live. This feeling of nostalga continued throughout the night hearing songs from the last four decades from all sorts of movies. Songs like ‘Cry for me and Big Girls dont cry’ from Dirty Dancing. Nice to hear the songs in their original formats and performed live. What was magical about this production was not only the music but the writing. Based on a book by Marshall Brickman and Rick Elice each of the boys we really get to know in depth the personalities background and how they feel. Which make their journeys to stardom even more incredible. Hearing about things like Tommy Devitos million pound debt that the band took on from the mob. At the time the band must have felt a lot of pressure to churn out hits especially Frankie to pay off Tommys debts. Proving that their road to stardom isnt an easy one. The band really had to fight for their music and for it to be played too in the early days. The new Jerseys accents were definitely on point all the cast carried them off perfectly, well done Stephen Gabis! I really loved the outfits too they were awesome, well done Jess Goldstein. Took me straight back to the 60’s glittery jackets and dance movies to go with them. All in all a fantastic night, slick set design and quick scene changes and brilliant music. The orchestra and band were amazing too. The audience felt the same and stood up at the end to clap and dance the night away. I must mention Lewis Griffiths deep bass vocals very funny character esepcially in the second half! If you want a fantastic night out followed by an awesome story of a band that had 40 number one hits! The show is packed with their tunes, including Beggin’, Sherry, Walk Like A Man, December, 1963 (Oh What a Night), Big Girls Don’t Cry, My Eyes Adored You, Let’s Hang On (To What We’ve Got), Bye Bye Baby, Can’t Take My Eyes Off You, Working My Way Back to You, Fallen Angel, Rag Doll and Who Loves You. The press in the past really give this musical brillaint reviews. In this case bBelieve the hype its true!! Its a 5 star from us, congratulations cast and creative! On from now until Saturday 16th February 2019.